I'm so so so so so so happy that Ernie is finding NYC so suitable. I feel content that Nicky finally has a feline in his life (and a second red head to boot!). It's true that I'm actually a cat lady, and Jeff is just my beard, I'm glad to be in good company with Nicky and Ernie! Can't wait to meet him! For years I've been talking about the art I want to put above our bed, and we're finally getting around to making it happen. This is an old photo, but basically what the room looks like now (minus the orimono pillow which is now in the living room). 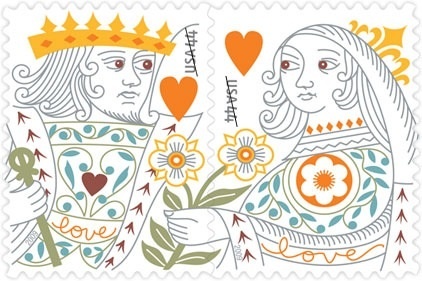 When we got married in 2010 we used these fab stamps on our invitations. I fell in love with the design and that's what I want to hang above our bed. I love the colors, love that if hung above our bed, the King would be on Jeff's side, and the Queen on mine and love the symbolism from our wedding. I'm not huge on having tons of wedding stuff out and around our apartment (idk why), but I think this is a subtle touch. Oh, and I want it to be HUGE. But the stamps are tiny, how do we get them to the large size that will make me happy? Jeff said: "Oh, we just have to vector it, too easy". Here's the Deweese translation: if you want to increase the size of a graphic image without it getting too pixelated, the vectoring process helps smooth out the lines to make them clear at almost any size. We used a free online service appropriately called Vector Magic to do the dirty work. You simply upload the image (this doesn't really work for photos, just graphics), the website vectors your image (takes a couple minutes) and the result is a pdf file that you can then upload to any online printing service. We're going with Poster Burner per your suggestion and then I want to add a huge white mat and frame. PS... 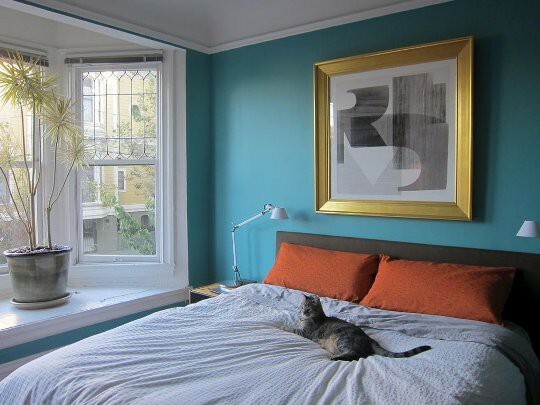 I'm actually thinking about re-painting our bedroom, again. It started out dark green and now is a grey/blue. Since the living room is soooo grey now, I've been craving something different in the bedroom. What do you think about this? Picture it with the stamps! PPS... Yes I realize this would be the third color in our bedroom since we moved in 4.5 years ago. But it's not like I'm switching husbands! Love this stamp art idea! Adobe Illustrator can also easily convert graphics to vector that you can then edit (move, resize, or change color of different elements). I use Illustrator all the time for logo design.